Did you know that we stock Contigo travel containers? Their unique products are some of the most sought-after thermoses around! And their patented autoseal mugs are the top of the line when it comes to heat retention and ease-of-use. As the name suggests, the autoseal mouth closes automatically in-between sips, preventing spills and locking in heat! Go ahead and put the thermos in your purse or lay it down in the car; you can trust the autoseal to keep contents from leaking. These units are also double wall vacuum insulated! As a result, hot beverages will stay hot up to 7 hours and cold beverages up to 18 hours. 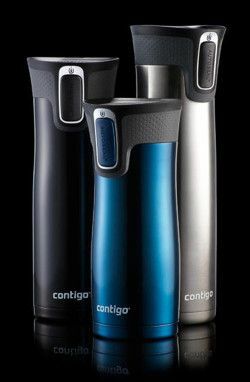 The autoseal mugs from Contigo are perfect for keeping that caffeine hot while at work or running errands! Cold beverages stay cold all day and will never sweat. If cleaning is a concern, the new autoseal lids have an easy clean lid that partially disassembles and allows you to rinse out all the nooks and crannies. The top portion is even dishwasher safe (top rack only). Take a look at the short video below to see all of the features of the autoseal mugs from Contigo. Contigo travel mugs are priced around $25 – 30. Stop by our Housewares department for our full selection. Spill-proof mug retains beverage temperatures for hours! -Patented AUTOSEAL® lid automatically seals between sips to eliminate spills and leaks -Lid underside flips open completely for easy cleaning -Easy, one-handed use with no caps or spouts -Double-wall vacuum-insulated stainless steel keeps beverages hot for 5 hours or cold for 12 hours -Top-rack dishwasher safe lid -Fits most single-serve brewers -Fits car cup holders -100% BPA free -Available in Stainless Steel, Black, Monaco Blue, Violet 16 oz.